I bought and sold Feather in 2003. We had a short love affair as I unknowingly prepared her for her new owners with new Ronstan RF-5 Halyard stops, RF-5 Headknocker, Harken Boom Vang, new mooring lines and new running rigging. After I completed all of the new items I towed her from San Francisco to Bainbridge Island, Washington. The second happiest day of ownership of this boat. She was sold! I can say without a doubt... The P-15 tows very well even behind a small Honda Civic. I purchased Feather without Sea Trials. I drove a few hundred miles on a couple of occasions to look at some very used and abused boats. Then I got lucky and found Feather just 50 miles away and in excellent condition. I had been lurking (looking) for a small trailerable for some time. I had read and was told how stable the P-15 is under sail. I figured with so many made and with the following of sailors. How could I go wrong with a P-15? Admittedly my sailing experience was limited and I was used to much heavier craft ( with keels). In the heavy 20 knot plus winds of San Francisco Bay, this little lightweight scared the #&%* out of me on several occasions. A little advice... 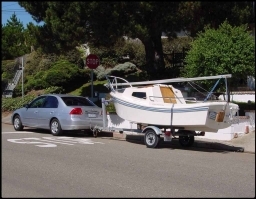 If you are new to sailing or trading down from a heavier craft, be certain to test sail the P-15 before you buy. If you must have a boat with no keel, think about how harsh the winds are where you are, and test sail before you buy! It's entirely possible you may be like me and not like the Dinghy sailing attitude where you are considered "moveable ballast".